Deep in the heart of the South Carolina Pee Dee, the small community of Mullins is known for its tobacco production. In fact, Mullins was home to the state’s largest tobacco market in the early twentieth century. Since the late 1800s, tobacco auctions were held in buildings such as the now-demolished Old Brick Warehouse, selling the region’s famous Gold Leaf tobacco. This historic pole barn in rural Mullins serves as an example of where and how tobacco was cured, or dried. It was built by local farmer John H. Dillard and his two sons around 1894. The barn originally utilized a brick furnace to cure the tobacco leaves. Later, in the 1950s, an oil burner replaced the furnace. Curing with artificial heat was common in South Carolina; in other places natural ventilation was preferred. Flues, or openings, sat just above the barn’s floor, which was often made of dirt, as in this case. These flues allowed heat to circulate among the hanging leaves. 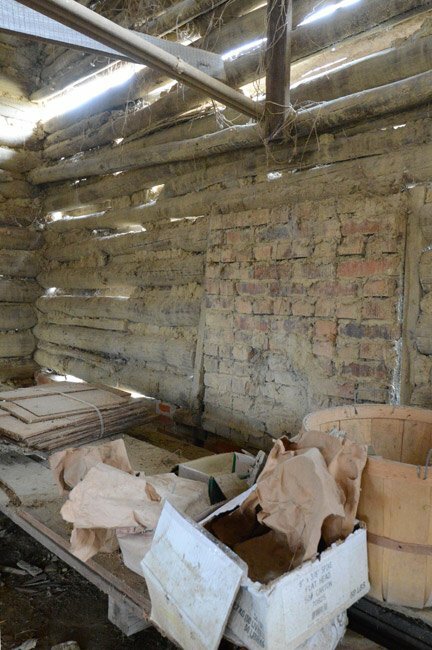 The photo below shows a brick flue inside the Dillard Barn, its circular opening now filled. Weatherboard was eventually added to the barn’s exterior to help prevent heat from escaping. The shed roof that once surrounded the barn, of which there now remains only a section, provided shade during the stringing process, when leaves were strung on poles to be hung within the barn (hence the name “pole barn”). The Dillard Barn was utilized for curing tobacco until 1981 when larger bulk tobacco barns were built on the property. However, the original Dillard Barn remains standing with remarkably few alterations, providing an increasingly rare reminder of Mullins proud agricultural past. 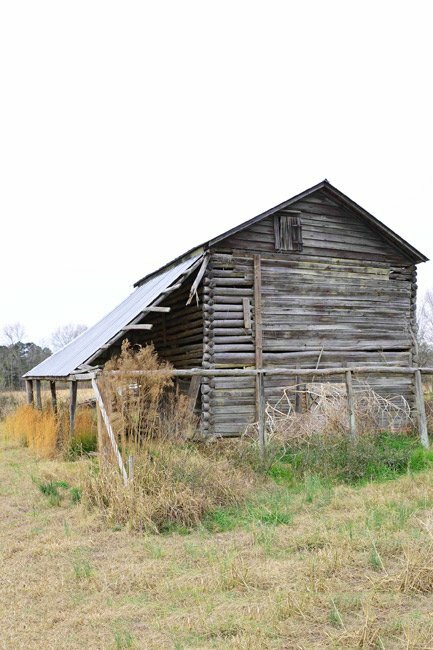 The Dillard Barn is significant for its association with the production of bright, or flue-cured, tobacco in Marion County, its connection with the development of Mullins as South Carolina’s largest tobacco market at the turn of the twentieth century, and as an excellent and intact example of a log or pole tobacco barn. It is an increasingly rare type of agricultural resource and one that is rapidly disappearing from the landscape of the Pee Dee region of South Carolina. The Dillard Barn, built ca. 1894-95 by John H. Dillard and his sons A.E. and Daniel Dillard, was used for curing tobacco from its construction until 1981 when bulk tobacco barns were placed on the property. There have been no additions to the barn since its construction, and few alterations. The original wood shingles were replaced with a tin roof, and in the 1950s, as curing fuels and technologies evolved, the brick furnaces and original flues were removed and replaced with an oil burner. The log barn is supported by a brick foundation with a dirt floor. It was constructed in a single pen plan, and the 6’ to 8’ logs used in the construction are saddle notched with a chinking of brick and clay. Weatherboards were placed between the logs on the exterior of the building. The building with its sheds has the appearance of a gable-on-hip roofed structure.